How do Forensic Scientists Analyze Blood Spatter? 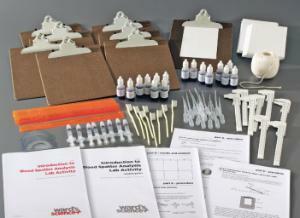 Both introductory and advanced kits have been aligned with all published National Standards. Pre- and Post-laboratory assessments and vocabulary words all target specific Science and Engineering Practices and common core standards. The teacher guide also contains specific "Did You Know" concepts that link the real world with scientific standards explored. A student copymaster is also included. Both activities include enough materials for eight student setups. In this kit, students will investigate the relationship between the height blood is dropped from and the diameter on the next drop on impact. They will also learn to recognize vertical blood drops on a variety of different textured surfaces and differentiate between high and medium velocity spatter such as from a gunshot or blunt force trauma. This kit utilizes NGSS Physical Science DCI PS2 (Motion and Stability: Forces and Interactions). What do bloodstains tell us? 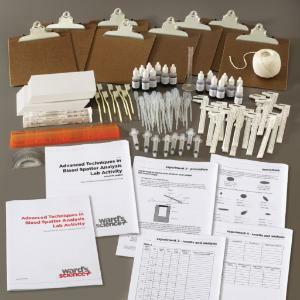 In this kit, students will discover how forensic scientists analyze bloodstains from crime scenes. 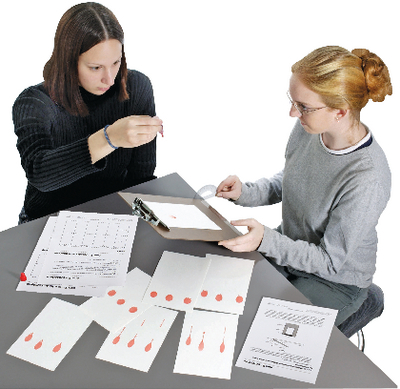 Students will learn to recognize and analyze bloodstain patterns on a variety of surfaces. They will then apply this knowledge to determine the sequence of events at a fictional crime scene and the approximate position of the victim when blood exited the body. This activity allows students to explore Physical Science Standards PS2. 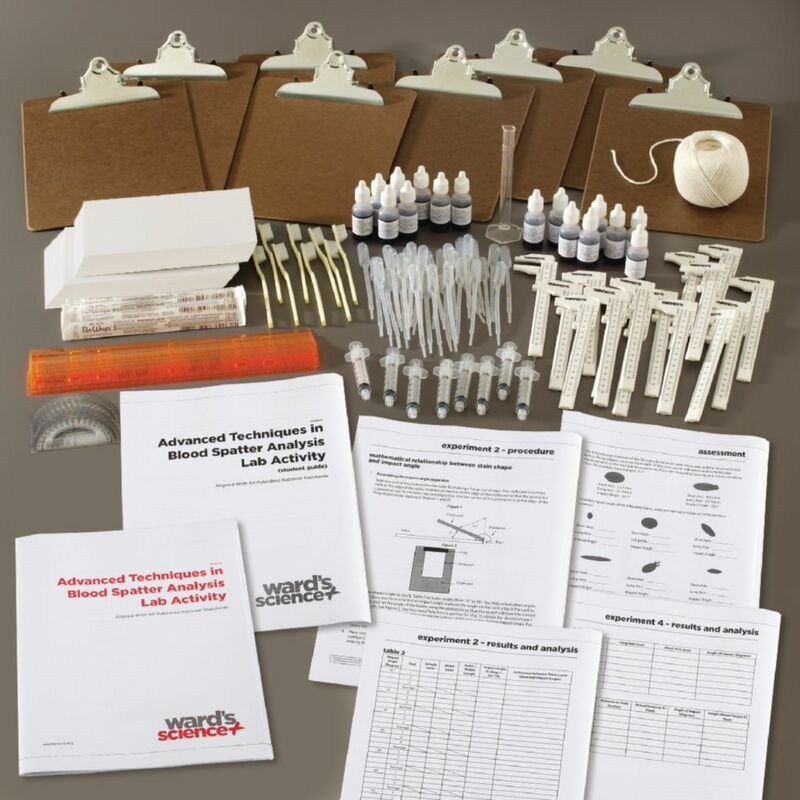 Ordering information: Introductory Blood Spatter Analysis Kit contents include Protractors, Rulers, Clipboards, Toothbrushes, Syringes, Simulated drip and projected blood, Simulated transfer blood, Vernier calipers, Index cards, Pipets, String, 10 mL graduated cylinder, Plastic and paper bags, Poster board and/or computer paper, Unlined paper or freezer paper, Cardboard, A non-porous surface, such as painted wood or Plexiglass, Flat, non-porous wall surface, Paper towels, cloths, rags, etc., Object such as a hammer, screwdriver, shoe, etc., Tape, Tongue depressor or plastic knife, and Digital camera and/or drawing/sketching tools. This activity can be completed in three or four 45 minute class periods. 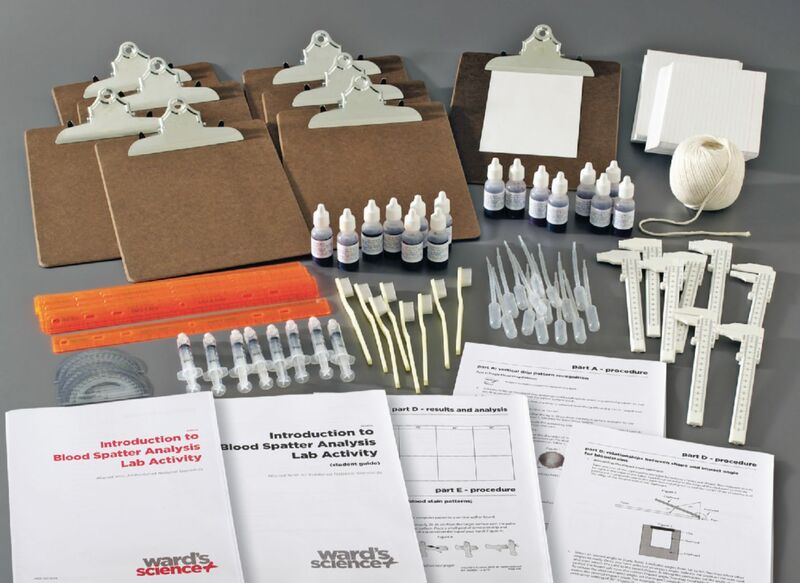 Advanced Blood Spatter Analysis Kit contents include Protractors, Rulers, Clipboards, Toothbrushes, Syringes, Graduated cylinder, Tongue depressors, Vernier calipers, Index cards, Pipets, String, Simulated transfer blood, and Simulated drip and projected blood. This activity can be completed in three or four 45 minute class periods. Materials required but not provided are Concrete block or brick, Glass square, Meter sticks and/or metric tape measures, Carpet piece, Denim cloth, Vinyl flooring piece, Computer paper, Cardboard, Paper bag, Piece of cotton cloth, Plastic bag, Piece of polyester cloth, Plexiglass, Ceiling tile cut in 10" square, Masking tape, Scientific calculator with trigonometric functions, and Digital camera and/or drawing/sketching tools.